Island living at its best! Enjoy the laid-back island pace and million dollar ocean views from almost every room in this luxury custom villa. As you walk through the custom carved french entry doors you are immediately greeted by the crystal blue ocean with an entire wall of doors opening onto the large covered terrace and infinity pool. The villa has a large, airy, open floor plan with cathedral ceilings in the main living, dining, and kitchen area. The foyer and living room are adjoined by the dining area and the striking kitchen (with granite counters, upgraded appliances, bar, and eating area). Off of the kitchen is a separate family room with a fireplace that also opens out to the terrace, and an additional den/fourth bedroom, On each wing there is a separate master suite with Jacuzzi, walk-in shower, double sinks, and more incredible views. One master suite has double french doors that open out to the expansive terrace and 43 foot long fully tiled lap pool and of course the panoramic ocean views. Downstairs there is another bedroom, 2 car garage and plenty of storage that could easily be converted into an additional living space. 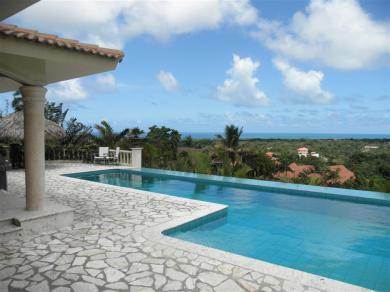 Located in a 5* upscale, secure, gated community on the hillside betweeen Sosua and Cabarete you will not be disappointed by this beautiful home. Contact the listing agent today for additional pictures and more information.